Popular spiritual writer and teacher Jan Frazier shows how to move from emotional and mental turmoil to quiet joy and happiness in The Freedom of Being: At Ease with What Is. Frazier, the author of the bestselling When Fear Falls Away: The Story of a Sudden Awakening, offers practical and effective suggestions for developing "present-moment" awareness as the key to awakening. Frazier shows how getting caught up in being on a spiritual journey often sustains the illusion of time--specifically some future time when you hope to awaken. But letting go of the idea of the future and staying focused in the present can give you access to a rich life free of suffering. 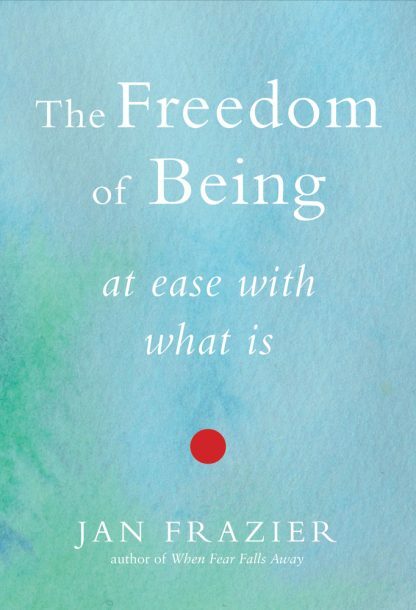 Whether you feel stuck in your life, or simply want to suffer less and live more consciously, The Freedom of Being offers a blueprint to make the shift into the present. Jan Frazier is a writer, spiritual teacher, and the author of several books including When Fear Falls Away: The Story of a Sudden Awakening. Her poetry and prose have appeared widely in literary journals and anthologies, and she has been nominated for a Pushcart Prize. She lives in southern Vermont.